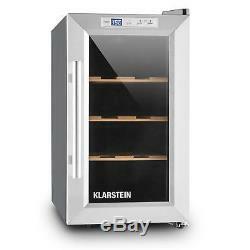 Klarstein Wine Refrigerator Reserva Piccola Class B 8 bottles Wooden Rack. 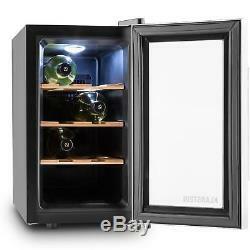 Wine refrigerator for eight standard bottles of wine. Adjustable cooling temperature: within 8 and 18 degrees Celsius. Illumination by switchable blue LED lamp. Temperature sensor: cools when internal temperature is higher than set temperature. Includes three wooden shelf bays. Recess laterally embedded in the door handle. Housing made of metal and plastic. Dimensions: 26 x 47 x 51cm. Interior dimensions: 17.5 x 35 x 31cm (WxHxD). 3 x wooden shelf inserts. 1 x English user manual (other languages: German). 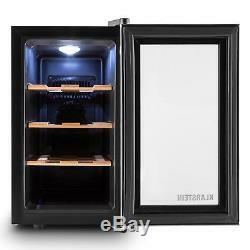 Attractive wine refrigerator for eight bottles with charming interior lighting. Convenient operation with built-in touch surface. Stylish wine storage on three removable wooden grids. 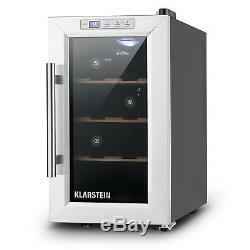 Adjustable cooling of 8 ° C to 18 ° C. This attractive wine refrigerator from the Klarstein Reserva Piccola series is a practical and stylish appliance for the avid wine drinker. Inside the wine fridge there are three individually-removable wooden slats with space for eight wine bottles, so that you can always keep your current favourites at the right temperature. If operated at a room temperature of 25 degrees Celsius, it can cool down to a temperature between 8 and 18 degrees Celsius. 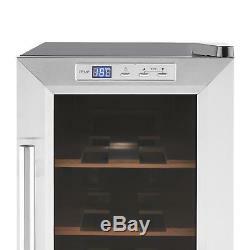 When the wine fridge is empty, it takes about 1.5 hours to cool down to a temperature of 15° C, or about 2-2.25 hours to reach a set temperature. A temperature sensor ensures that the wine cooler operates only when the internal temperature exceeds the set temperature. 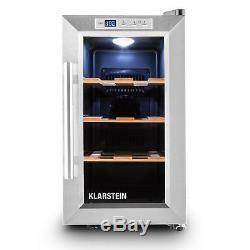 Even from the outside, the Klarstein Reserva Piccola wine refrigerator convinces with its stylish design. The compact shape is hidden in an elegant black metal housing. The window of the front door gives a charming look at the fine wines inside. A brushed stainless steel frame gives the door and unit an extra luxurious accent. Operation is simple via the attractive touch surface, which allows you to easily set the desired cooling temperature in degrees. Switchable LED lighting illuminates the stored wine bottles in an atmospheric blue light. A pleasure for all the senses! 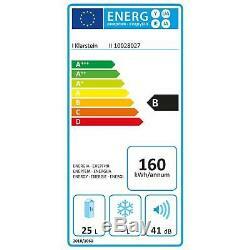 Mandatory Energy consumption ratings below are in conjunction with the Commission Delegated Regulation (EU) No 1060/2010. Energy efficiency class of the model: B on a scale of A+++ (most efficient) to G (least efficient). Annual energy consumption (AEC) in kWh/year: The annual energy consumption is 155 kWh per year based on standard test results for 24 hours. Actual energy consumption will depend on how the appliance is used and where it is located. Wine Compartment Volume: 25 litres / 8 bottles - The term "bottle" refers to the number of standard bottles of 0.75 litres, which can be stored in the device. The climate class "Extended temperate " is classified with symbol "SN" for an average ambient temperature of 10 ° to 32 ° C. The climate classification "Temperature" is classified with symbol "N" for an average ambient temperature of 16 ° to 32 ° C. The class climate "Subtropical" is classified with symbol "ST" for an average ambient temperature of 16 ° to 38 ° C. The class climate "Tropical" is classified with symbol "T" for an average ambient temperature of 16 ° to 43 ° C.
Airborne acoustical noise emissions: 30dB expressed in dB(A) re1 pW, rounded to the nearest integer. This appliance is intended to be used exclusively for the storage of wine. The item "Wine Cooler Fridge Refrigerator Bar Hotel Restaurant 8 Bottles Glass Wood Rack" is in sale since Thursday, November 29, 2018.